One of the four key challenges in successful conformal coating production is the Upstream Processes. Upstream processes refer to everything that occurs before the conformal coating production begins and that has an impact (influence) on the conformal coating quality. In reality, there are a lot of factors that have a domino effect on the final results of the conformal coating production and understanding them can make a considerable difference. 2. Those factors that occur during the pre-coating production processes. Many problems that occur downstream in the coating process are due to the individual parts themselves such as the bare board laminates, components, molded parts and any other part that goes into the assembly process before coating. Problems with solder resists (masks). If the Solder mask applied to the bare laminate is either wrongly specified or incorrectly cured, then this can lead to wetting issues of the conformal coating to the resist later in production. If the surface energy of the resist is too low the coating will not adhere well enough or it may even show signs of conformal coating de-wetting. Problems with mold release agents used on individual parts and components. When components are made, many times they are molded. However, this can lead to problems of the conformal coating again adhering correctly to the individual parts. Problems with cleaning of parts, components and boards. Incorrectly cleaned parts used in the assembly can lead to contamination on the assembled board which is incompatible with the conformal coating thus leading to de-wetting, de-lamination, and corrosion defects. Problems with packaging of the parts. The transfer of contamination to parts, such as the bare-board laminates in the individual packing materials are not uncommon. The material it is wrapped in can contaminate the first laminate in a stack of boards, resulting in poor performance, while the rest of the laminates in the stack are prefect. Receiving the components, laminates, and parts in the correct condition before assembly is very important. In fact, more often than not, if there is a problem relating to adhesion of the coating, it can be traced to the solder resist and issues with this thus the need for utmost care at this stage. Managing to receive all of the parts in excellent condition is only half of the process. The next step for success is to carry out all of the manufacturing processes in a suitable way that does no harm to the boards, before finally conformal coating the assembled board. The reality is that the assembly process can be very dirty if not well controlled. Generally, conformal coatings hate contamination. Soldering contamination. The wrong incompatible flux or even the wrong amount of a normally inert soldering material can cause both short and long term problems such as de-wetting, de-lamination and corrosion. Cleaning Contamination. Incorrectly cleaning the board or leaving cleaning fluid residues on the surface of the board could cause the coating process to fail. Incompatible manufacturing materials. Products like RTV (Room Temperature Vulcanisation) Silicones can be a disaster to conformal coating production regardless if it’s due to deliberate application as a staking material before coating, or accidental transfer / migration of the silicon material. Machine transfer contamination. Contaminants transferred to the circuit boards from equipment such as oils and greases can be devastating to a circuit board. These can come from the machines themselves or the operators using the machines. Human transfer. Contaminates such as food residues off operator’s hands, barrier creams passed on, grease from hair and contact with clothing can also affect coating production. What Can We Do About the Problems Upstream? The first place to start is to audit the whole system. Within the audit, identify all the potential points that could cause problems and after this, find a solution to these issues. Cleanliness of Parts: Control of the laminate and component cleanliness through quality control before use. Test the parts to see if they are within the set specification. Storage: Make sure all the parts are stored in a clean, suitable area before they are used. Shop Floor Cleanliness: Minimise potential contaminants on the shop floor and isolate potential problem materials like silicones. Operator Cleanliness: For operators, ensure that hands are clean (gloved if necessary) and potential contaminant issues like hair, feet and clothes are covered. Knowledge: Educate operators of upstream processes and what the problems can be downstream in the conformal coating process if their production goes out of control. Maintenance and its influence: Ensure that maintenance is controlled and doesn’t contribute to contamination. Machine Cleanliness: Clean all the machines upstream regularly to ensure that no transfer of contamination occurs to the circuit board. Board Cleaning: Ensure that the cleaning process is optimised to clean the board assembly correctly and the rinse process is effective. There are many good habits and practices that can be introduced. 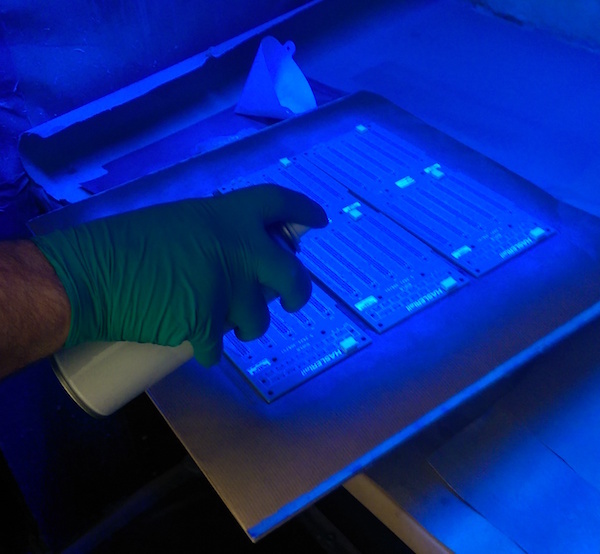 Doing this leads the conformal coating process downstream to benefit consequently avoiding operators from scratching their heads as to why things are going wrong. Upstream processes can be devastating to the conformal coating process. The problems can come from the individual parts of the assembly before production and they can develop due to the pre-coating operations during assembly. Controlling these processes can lead to a conformal coating process that only has to worry about its own issues and not what is happening upstream.